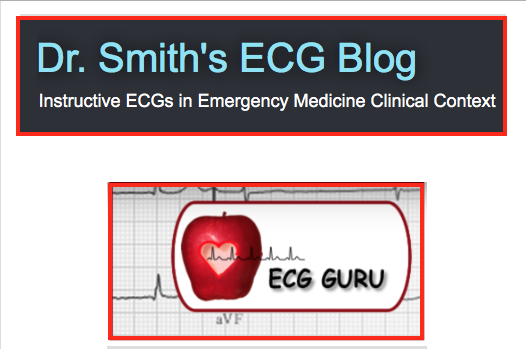 I have added a new component to my ECG Blog = periodic publication of Basic ECG Concepts. 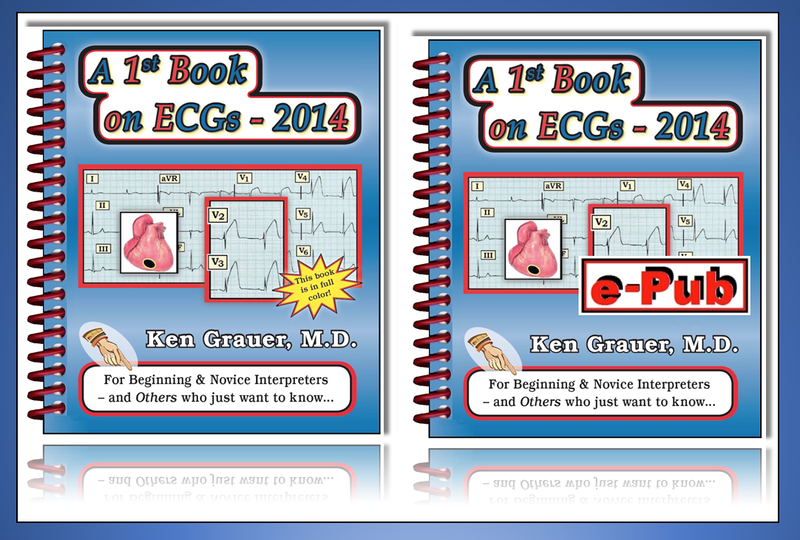 These will be excerpted with modification from my new introductory book to ECG Interpretation = “A 1st Book on ECGs-2014” and the expanded 1st-ECG-Book-ePub version (which is out in kindle-nook-kobo-ibooks). 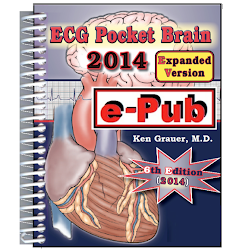 Rather than specific cases — the goal of these Basic ECG Concepts is concise review of some less advanced topics. 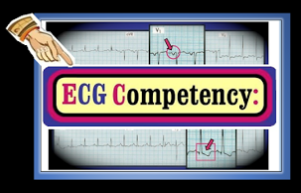 I hope this new component to my ECG Blog is of interest to you! Panel 1 (in Figure-1) — The first downward deflection of the QRS complex is termed a Q wave. Panel 2 — The first upward deflection of the QRS complex is termed an R wave. Panel 3 — The downward deflection that follows the R wave is termed an S wave (as long as it descends below the baseline). 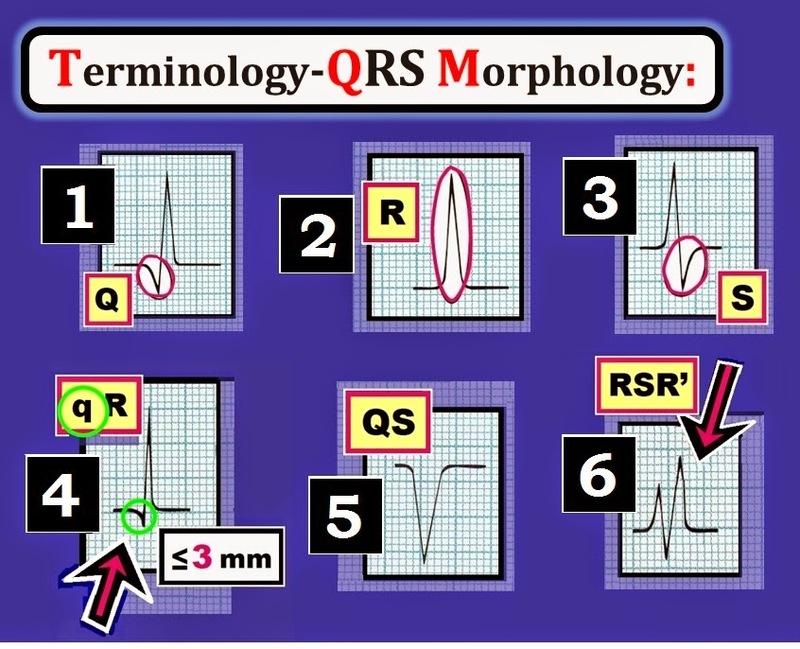 NOTE: Not every QRS complex necessarily has all 3 components (ie, a Q wave, R wave and S wave). 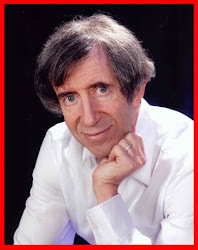 Sometimes — there is only a single component (such as an upright R wave, but nothing else). There is only a single component (R wave) in Panel 2 of Figure-1. In contrast — there are 2 components to the complexes in Panels 1 and 3. In this case — we respectively label these 2-component complexes as a “QR complex” (Panel 1) and an “RS complex” (Panel 3). 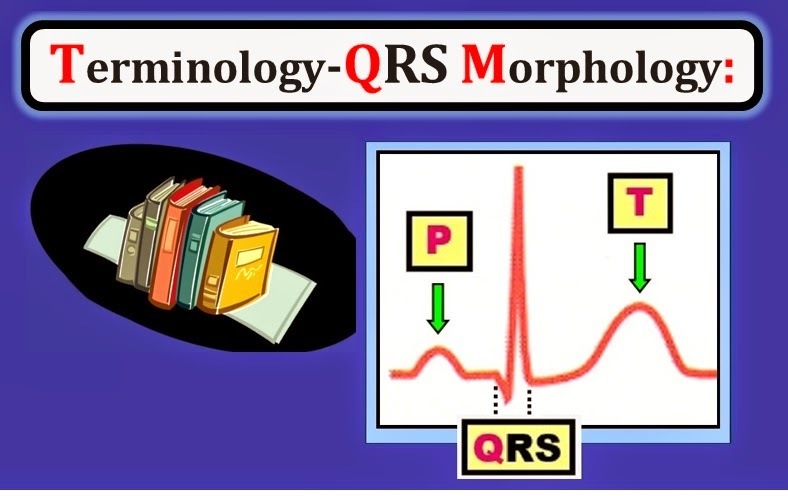 Figure-1: Rules of the Nomenclature System for QRS Morphology. 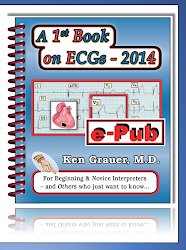 (Figure reproduced from A 1st Book on ECGs-2014). NOTE — Enlarge by clicking on Figures — Right-Click to open in a separate window. (See text). Panel 4 (in Figure-1) — illustrates that smaller deflections (that do not exceed 3 little boxes = 3mm) are denoted by lower-case letters. In contrast — larger deflections that are greater than 3 little boxes in depth (and which look to be wider) are denoted by capital letters (as seen for the Q wave of the QR complex in Panel 1). Panel 5 — When there is only a negative deflection — the configuration is called a QS complex. This is because in the absence of any R wave — we are unable to distinguish between a Q wave, an S wave, or some combination of the two. Panel 6 — IF there is a 2nd positive deflection — it is given a prime notation (an R' or r', depending on its size). A 3rd positive deflection is designated an R'' or r''. Similarly — a 2nd S wave (if present) is an S' or s'. Describe each of the 10 QRS complexes in letters using the Nomenclature System from Figure-1. Figure-2: Describe each of the above QRS complexes in letters. Our answers follow below in Figure-3. 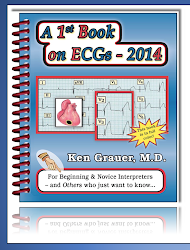 (Figure reproduced from A 1st Book on ECGs-2014). 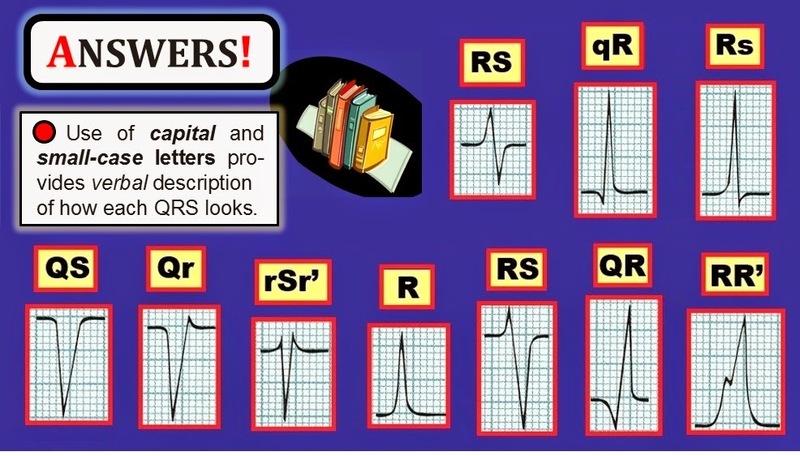 ANSWER to Figure-2: As we have already noted — the Nomenclature System using capital and small-case letters allows verbal description of QRS appearance to providers who may not have the actual ECG in front of them. NOTE: We use the Nomenclature System for QRS Morphology often in the interpretation process (when writing down our findings) — and, in documentation of our interpretation in medical records. Our ANSWERS to Figure-2 are displayed below in Figure-3. Figure-3: Each of the QRS complexes from Figure-2 is labeled (See text). 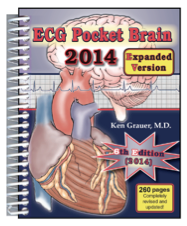 (Figure reproduced from A 1st Book on ECGs-2014). The larger and wider a Q wave is (as in the QR pattern in the lower row of Figure-3, compared to the qR pattern in the upper row) — the more likely it is that myocardial infarction (heart attack) has occurred at some point in the patient’s history. Assessment of ST-T wave changes can then be used to provide insight as to whether infarction is new or old. The QS pattern (lower row in Figure-3) — is most commonly seen in the anterior leads. Depending on other parameters (such as QRS complex width and ST-T wave appearance) — clinical implications of this QS pattern may be similar to clinical implications of a wide Q wave (= possible previous infarction), especially if QS complexes are present in multiple leads. On the other hand — one or more QS complexes are normal (and expected) when the patient has QRS widening from LBBB (Left Bundle Branch Block). An rSr’ pattern (similar to that in the lower row in Figure-3) — is commonly seen in association with complete or incomplete RBBB (Right Bundle Branch Block). There are QR complexes in high lateral leads I and aVL. Although under normal circumstances these large Q waves would suggest prior lateral infarction — they are non-infarction Q waves in this unfortunate 22-year old man with Duchenne Cardiomyopathy. Note the qRs pattern in lead V2. Q waves like this are usually not normally seen in lead V2, especially given that an initial r wave was present in lead V1. However, in a patient with Duchenne Cardiomyopathy — this also most probably represents a non-infarction q wave. A polyphasic rSr’s’ complex is seen in lead V1. Although typical in patients with Duchenne Cardiomyopathy — this pattern would otherwise be highly unusual. Most other leads from the tracing in Figure-4 manifest RS complexes. Designation by a capital R and capital S is merited given the relative size (>3mm) and width of these positive and negative deflections. Figure-4: 12-lead ECG of a patient with Duchenne Muscular Dystrophy. 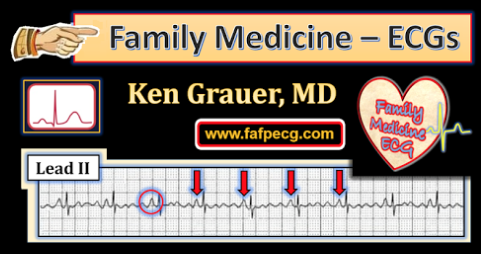 This tracing is reproduced from our ECG Blog #45 (See text). 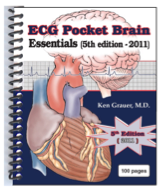 The material and first 3 Figures in this ECG Blog #88 were obtained from our new introductory book, “A 1st Book on ECGs-2014”. The expanded ePub version of this book is out in Kindle-Kobo-Nook! (- the iBooks version is coming soon!). Because we are not limited by space constraints of a hard copy book — explanations are enhanced and our discussions are more-in-depth in the ePub version.